Today, Setapp is introducing a new breakthrough app to the collection — Folio. What is it about? Think of Folio as the ultimate time machine and version control tool for all of your design-related files. It allows you to quickly look up and restore any previous version of your artwork, greatly expanding the possibilities of your creativity. In addition, Folio lets you collaborate with other designers and work out of the same documents, including all the previous versions! Here’s how you do that. 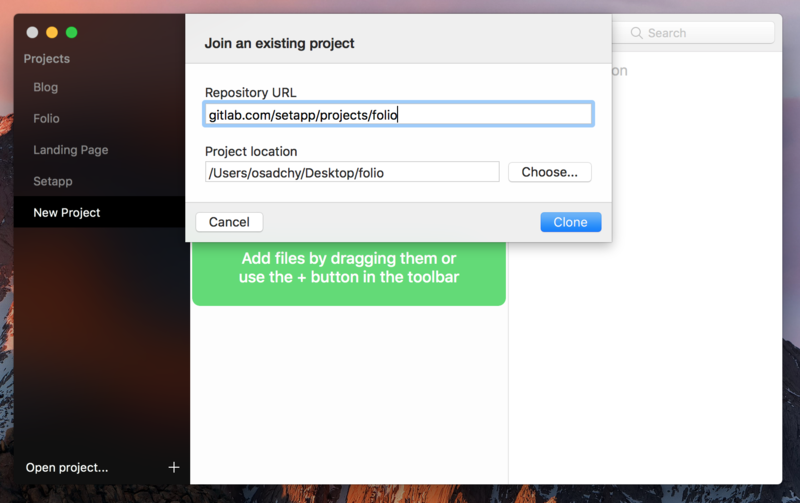 To keep things easy and avoid duplicates, Folio can treat any existing folder on your Mac as a project. Click + in the project browser on the left side to start a new project or just drag some files onto the app. Folio fully supports Adobe and Sketch files. Note: If you delete a folder from your Mac, all its files and their versions would also disappear from Folio. To safeguard yourself from a potential disaster, make sure to create a new version each time a significant change within the file happens. Creating new versions is easy — open the project you are working on at the moment in Folio, type in a short message and click “Create version”. Folio would then save that version and attach a thumbnail so you can easily find it later. Using the history panel on the right side of the app, you can see at a glance all the iterations of your project. To go back to a certain version of the file, just click the gear icon next to the correct version and then “Revert to version”. Folio is a design workflow app that works for a whole team just as well as for a single designer by using Git. A complete copy of the project will be created on your computer, and every time you create a new version, it will automatically be published to the same Git repository. Now, with these Folio basics in hand, you should be able to fortify your design workflow and effortlessly collaborate with others without worrying that someone will override your files or that you could lose an important element in the process. See how well Folio fits within the 120+ collection of apps on Setapp and take your workflow a step further.